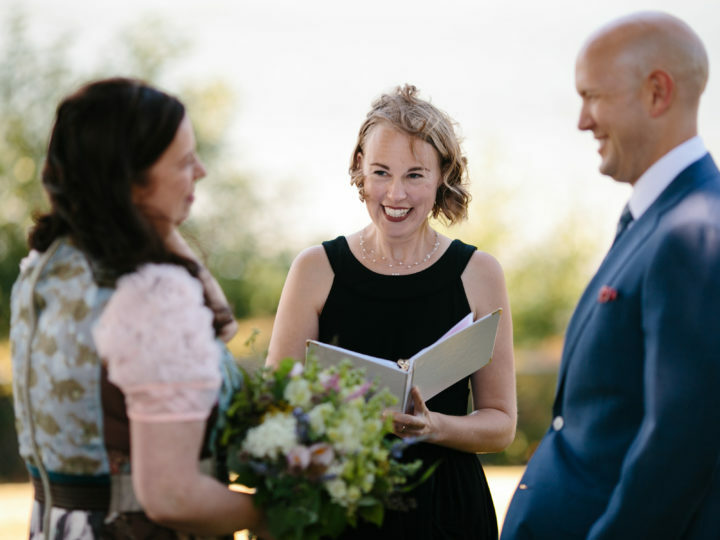 Next in our Officiant Q & A series is an interview with Vancouver Officiant Beth. 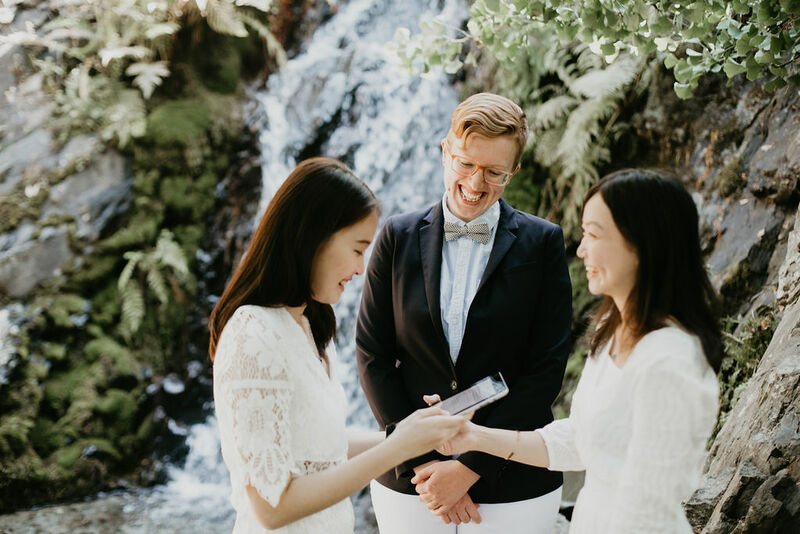 Find out Beth’s strangest wedding ceremony experience, why she believes in investing in your ceremony and what awesome question she asks couples when she meets them. When meeting with a couple, what’s the first question you like to ask them? First, I usually ask them to tell me their love story, because it helps break the ice and gives me context for who they are. But my favourite question (which I think I stole from Jane!) is, “What do you want your guests to say about your wedding when it’s over?” That usually helps them pinpoint their goals for the day. My favourite thing is when the guests think I’m a friend of the couple, or that I’ve known them for a long time. Or when a couple says, “You really GOT us!” That’s when I know I’ve done my job well. 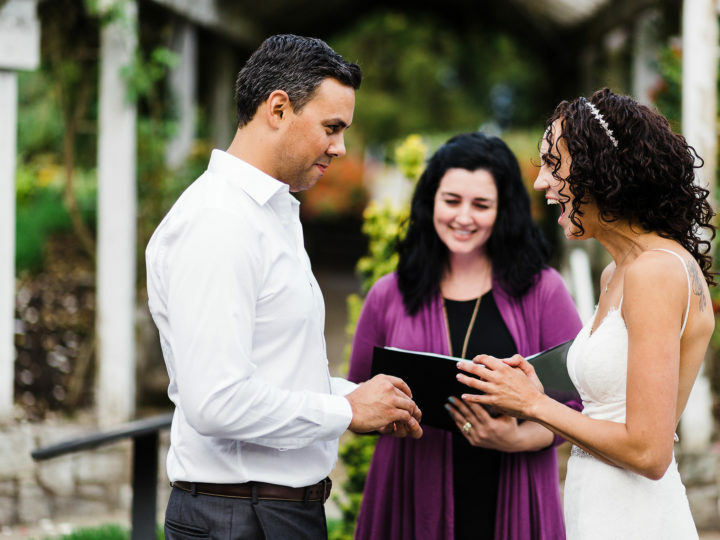 What is the best part about officiating weddings? The best part is being reminded over and over again, ceremony after ceremony, what a sacred honour it is to be loved, and to choose to love someone. The most challenging part is probably figuring out how early to leave your house to get to the wedding with time to spare, taking into account traffic and weather, without getting there way too early! I’m always stressed on the way there. What one thing should all couples know before their wedding ceremony? They should know who’s going to bring the marriage licence on the day of the wedding. It’s so easy to forget that crucial piece of paper! But also… they should probably know whether they want to spend the rest of their lives with their partner. Share your wildest or most memorable wedding moment! I once officiated a wedding where we all sat on pillows in a yoga studio, and there was a Vedic priest performing rituals to a constant soundtrack of large glass singing bowls. Oh yeah, and they also asked me to read a prayer in Spanish (and I’m definitely not fluent in that language!). That was a strange one. If you were getting married again, what would you want in your wedding ceremony? 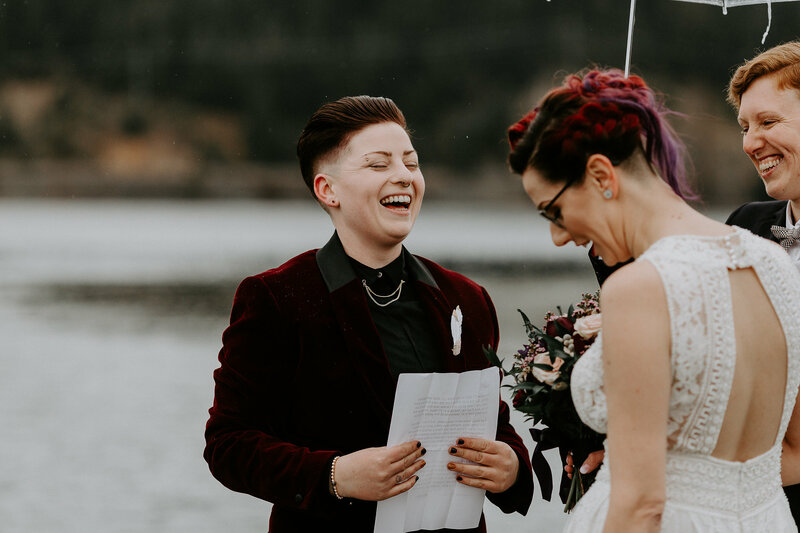 Our wedding was already pretty fantastic… but I think I’d give more time for really telling our story – the wild and winding road by which my wife and I got to our wedding day. Oh, and we’d probably double-check that the recessional music was ready to go (oops)! 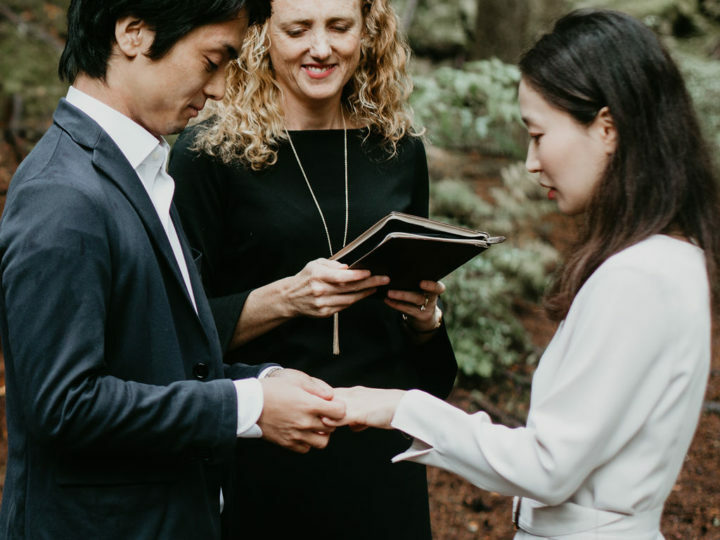 Committing to spend your life with someone carries so much weight and significance that I think it’s worth investing some extra energy to make sure the ceremony really reflects who you are as a couple, and what you value. Why do you think couples should invest in their wedding ceremony? 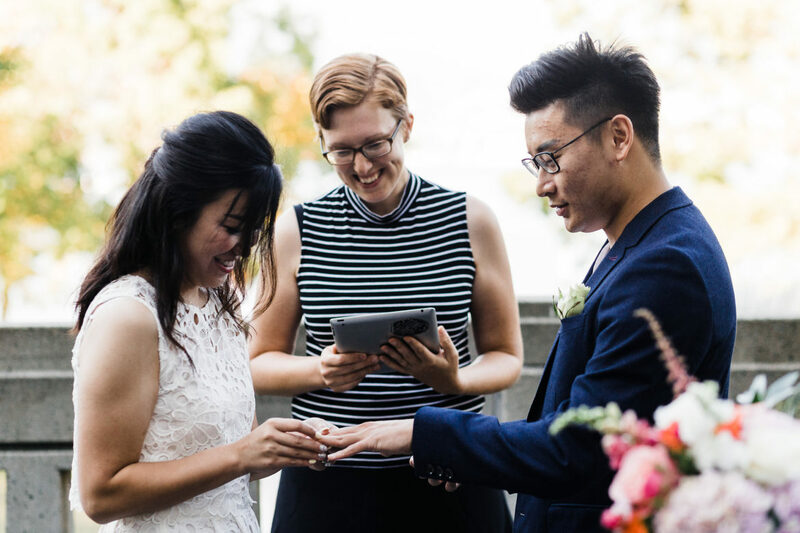 Ceremonies and covenants are no longer very common in our modern world. Weddings are one of the only “usual” ceremonies we have left. 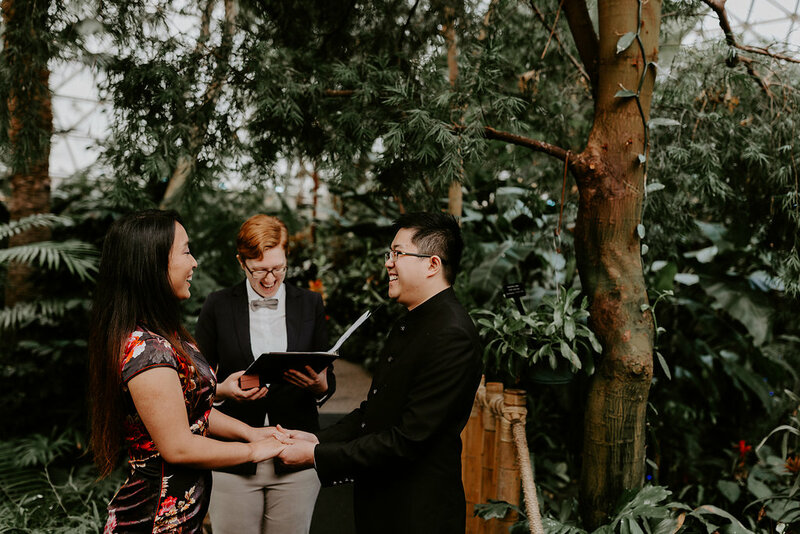 Committing to spend your life with someone carries so much weight and significance that I think it’s worth investing some extra energy to make sure the ceremony really reflects who you are as a couple, and what you value. 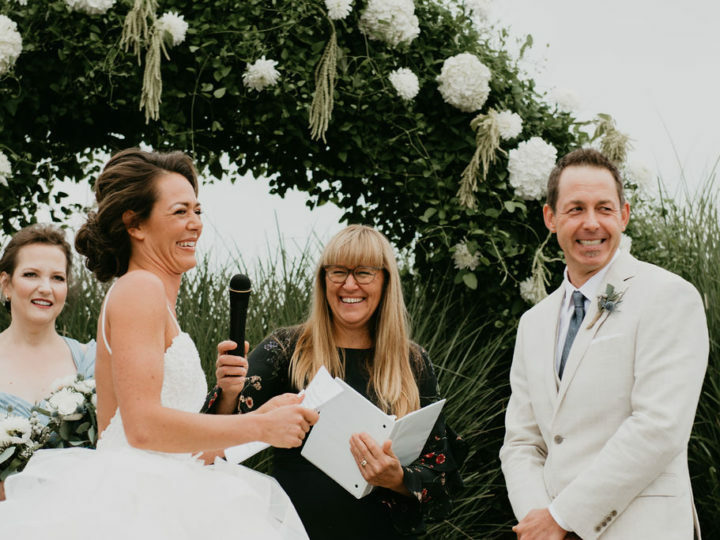 My favourite question to ask my couples is, “What do you want your guests to say about your wedding when it’s over?” That usually helps them pinpoint their goals for the day. I’m a giant nerd who loves birdwatching, reading science fiction, and doing escape rooms. Who is your dream couple that you’d like to officiate for? Glennon Doyle and Abby Wambach. Too bad they’re already married. What is your favourite wedding movie? Easy. “Bridesmaids.” There’s no competition. What do you wish for your couples? On their wedding day: that they’ll have planned and delegated enough to allow them to be fully present and aware, taking it all in, during their wedding. After their wedding day: that they’ll reach out to their friends (and to our YH&M relationship coaches) when they run into problems in their marriage. No marriage is without challenges, but as long as you’re willing to open up and ask for help, there’s always hope for mutual growth. A huge thank you to Beth for taking the time to do this interview and sharing her wisdom with us. 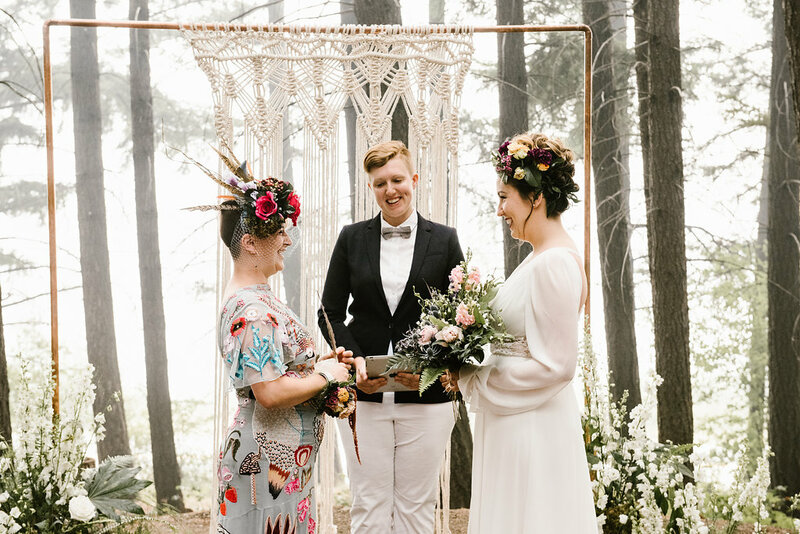 To learn more about Beth, and book her as the officiant for your wedding, head to Beth’s page here and check out her other interviews here and here.